After the Second Baronial War, the Magna Carta had already been established as an important emblem of English liberties and freedom from arbitrary rule. Early in the fourteenth century, it continued to be affirmed by English Kings. It inspired jurists to establish the idea of ‘due process under the law’, influenced the creation of the jury system, and helped to strengthen Parliament as an independent body. In the later fourteenth century and fifteenth centuries, however, the Magna Carta largely disappeared from political discourse. Throughout the Wars of the Roses (1455-1485) and the frequently autocratic reigns of the Tudor Kings and Queens (1485-1603), the Magna Carta had little direct influence on politics. Shakespeare’s play King John, which was probably written in the 1590s, didn’t even mention the Magna Carta. In the seventeenth century, however, this changed. Printed editions of the Magna Carta became more widely available and more people knew about it. Furthermore, England came under the rule of some particularly autocratic Kings—James I and Charles I—who sought to undermine parliamentary control over taxation. Among those who opposed the arbitrary rule of the Stuart Kings was Edward Coke. Coke initially gained his reputation as a jurist, but after he fell out of favour with King James I in 1616, he was dismissed from the King’s Bench and took up politics instead. To defend his views about the law and justice, Coke wrote an influential four-volume work, Institutes of the Lawes of England. To defend his views, Coke often turned to tradition and legal examples from English history. One of the examples that he turned to was the Magna Carta, which was the focus of his second volume. He argued the Magna Carta was evidence of the ‘ancient constitution’ of the English peoples and the ancient awareness of rights of protections against the abuses of Kings. Although the second volume wasn’t published until after his death due to royal censorship, his views about the Magna Carta were well known even during his lifetime. Coke was one of the key proponents of the Petition of Right, which the Parliament forced King Charles I to assent in 1628. It reaffirmed that the Magna Carta was valid and attempted to prevent the King from taxing without the consent of Parliament and imprisoning his subjects without trial, among many other things. long outlived him. Already in his lifetime, trouble was brewing. Charles I failed to keep to the Petition of Right. 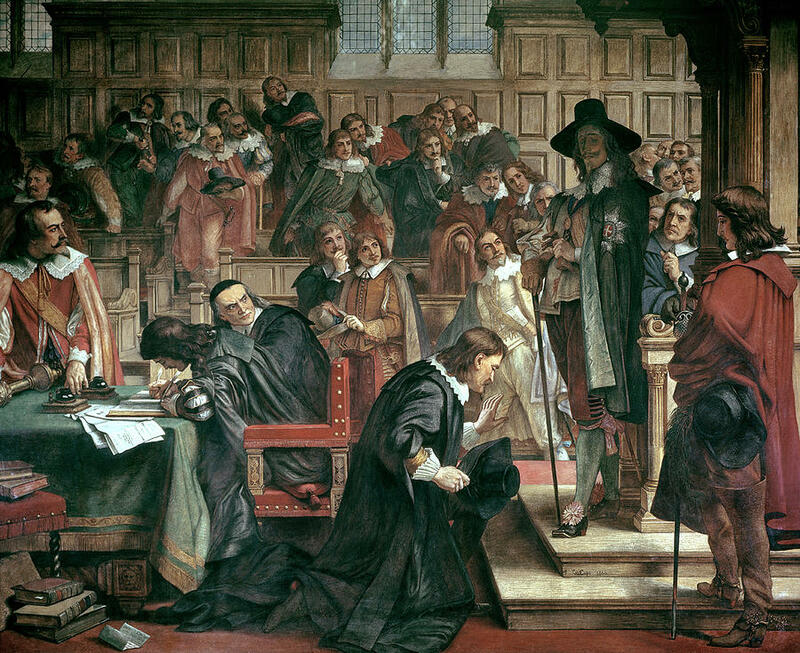 The last straw came in 1642, when the King brought 400 men into the House of Commons in an attempt to arrest five prominent members of Parliament. In retaliation, Parliamentarians from both the House of Commons and the House of Lords turned to military aid to protect themselves. For the next ten years, the English Civil War raged, as a result of which Charles I was executed and his son, Charles II, was forced to flee to mainland Europe. The rest of the seventeenth century was unstable for England. It endured a military dictatorship under Oliver Cromwell, the restoration of the monarchy when Charles’ son, Charles II, was placed on the throne, and a series of succession crises. In the ‘Glorious Revolution’ of 1688, the Dutch stadtholder, William of Orange was invited to be King of England alongside his wife Mary. The most significant achievement of the Glorious Revolution was the passing of the Bill of Rights in 1689. The Bill firmly established the boundaries of royal power, many of which reflected themes in the Magna Carta. It reiterated that it was illegal to levy taxes without consent from Parliament, that Parliament must meet frequently, that subjects had the right to petition the King, that Parliamentarians had the right to freedom of speech in Parliament, and that excessive fines and cruel punishments should not be inflicted. The Bill of Rights effectively established a continuous constitutional monarchy in England. No monarch has exercised absolute rule since, and there have been no further revolutions or civil wars against abuses of royal power. This is the major legacy of the seventeenth century. The Magna Carta was certainly a driving ideological force.